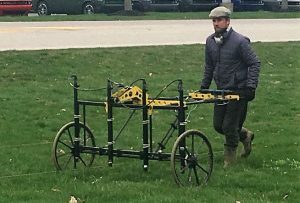 The Delaware County Historical Society, this week, has experts scanning the grounds of the historic Meeker property using Ground Penetrating Radar. It is hoped that the radar will reveal anomalies in the soil indicating location of the log cabin – earliest home of Forrest Meeker and his family. The society is also hoping to find the location of first barn, smokehouse, and other outbuildings. We should have the full report in a few weeks. 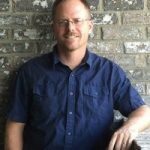 Thanks to funding from an anonymous donor, we were able to bring in Jarrod Burks, Ph.D., RPA, Director of Archaeological Geophysics at Ohio Valley Archaeology, Inc. The Meeker Homestead is a historic home and barn at the gateway to Delaware Ohio. The Delaware County Historical Society operates the Meeker Homestead Museum to present the history of the house and the family’s that have lived there. The Garth Oberlander Barn on the property is now The Barn at Stratford Event Venue. The Society continues to research the earliest history of the property to form a complete understanding of when and how the current buildings were constructed. In 2014, the Society had Dendrochronology Analysis done to determine the years of construction for both the Meeker House and Barn. You can read about it in House and Barn Dated. Ground-penetrating radar (GPR) uses radar pulses to image the subsurface. This nondestructive method uses electromagnetic radiation in the microwave band of the radio spectrum, and detects the reflected signals from subsurface structures. GPR can have applications in a variety of media, including rock, soil, ice, fresh water, pavements and structures. In the right conditions, practitioners can use GPR to detect subsurface objects, changes in material properties, and voids and cracks. Dr. Burks has been an archaeological Principal investigator with OVAI since 1999. He is an expert in the use of geophysical instruments in archaeology, such as magnetometers and ground-penetrating radar, and he has conducted geophysical surveys all across the country and beyond—including on missions to search for missing U.S. servicemen. Want to help complete this history?